I have been trying to find out what is the component in coffee which so clearly affects Th1 patients. Caffeine doesn't make the cut, as, although it has some effect on the Type 1 Nuclear Receptors, the affinity is low, and the observed symptomatic effects would require high concentrations of the drug, which are just not present in the diet of the average coffee drinker. Yesterday Wrotek suggested Chlorogenic Acid, and I have verified that he is correct. This is a culprit, and probably the major culprit. Here is an image of Chlorogenic acid (yellow backbone) as docked into the VDR, with the Xray structure of the docked 1,25-D for comparison. Note that the oxygens at the key helix 4 residues are effectively coincident. Chlorogenic Acid forms hydrogen bonds with the same residues as 1,25-D; ARG274, SER237, SER278 and (weaker) TYR143. However, it does not have a 'tail' to stabilize the lower part of the VDR receptor, so at best it is a partial agonist, and is more probably a total antagonist of Type 1 Nuclear Receptor activity. The affinity of Chlorogenic Acid for the VDR is consequently very high, with Ki calculating at 8 nanomolar. Assuming that this paper's concentration data are correct, and this one too, then just one cup of coffee contains several orders of magnitude more chlorogenic acid than would be needed to notice an profound effect on the VDR (and an effect the other Type 1 Nuclear Receptors, such as the Thyroid Receptors). Chlorogenic acid is also present with higher quantities in apples. Finally i have a strong motivation to quit drinking coffee, starting tomorrow I drink 1-2 cups a day but my coffees are espresso, dunno if espresso has less chloragenic acid but probably considering high amount of it there + high affinity, it won't matter. There is some Chlorogenic Acid in pears, too. Does this apply to decaff????? Ok, so now do we have to quit coffee to heal all of the way? I drink about 2 cups every morning. What differences could/would I see if I quit? I mean, what would you suspect would change? more herx? less herx? different symptoms? Trevor, thanks for all of your wonderful work... I think. Dr. Marshall - you are breaking my heart! Couldn't you have left us in a state of blissful ignorance when it comes to the pit falls of consuming that much cherished cup-a-joe's? 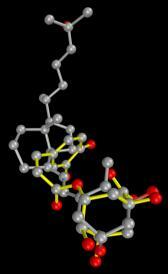 Stop your molecular modelling, before there is nothing left but water! Now, us coffee drinkers will have no choice but to start another support group! Sarcoidosis FM Lyme babesia 25D>7(Feb07) Ph1Aug05 Ph2Oct05 Ph3 Jun06 Valium Lyrica Ambien NoIRs limited outings covered Phase I 8/05, II 10/05, III 6/06. When I decided it would be OK to add coffee back into my diet, I did a little research on coffee and the liver. Although the reasoning for avoiding coffee would be different here, is it really necessary to totally cut it out or is moderation the key here too? Why wouldn't green tea be the same then as black tea? From what I understand, BOTH teas are actually the same plant although processed differently. So is it the process that changes the acid content? Or is it just that the study didn't include green tea? Reenie asks: Ok, so now do we have to quit coffee to heal all of the way? This is more about making sure that the immunopathology you feel really is immunopathology, and not your immune system being modulated by outside factors. Healing time or completeness is probably not going to be affected all that much. Drug effect is dose dependent. If you drink a lot of coffee, or strong black tea, you should be on the lookout. Actually, everybody should be on the lookout, but you only need to change things if you get to the point where you can't manage your meds dosage because cause and effect of the abx dosing becomes too complicated. If so, then there is probably this additional factor present. Julia, I am sure that if tea is not steeped for more than a few seconds, then fewer tannins, and I suspect other compounds too, will infuse into the brew. Green tea is typically steeped less than black tea, especially if you don't use a pot. The take-home message is don't use a pot, and dip the bags only until the taste is strong enough to be OK. I think green tea could be a problem too. No wonder the weak dip method came about. There was good reason. And here I am backsliding to stronger green tea. P.B. OH NO! PLEASE don't tell me! I have been celebrating the fact that after 20 years of refraining from drinking my beloved coffee because of bad side effects. (Even one cup gave me heart palpitations or skipping heart beats) I can finally drink it without problems. Isn't there a way to filter out that immunosuppressive chlorogenic acid you mentioned? We buy organic coffee and grind it ourselves using nice thick brown filters. Also is there a difference in coffee c. acid content depending on bean and process? Another thought is that I have plenty of IP response with very little abx ramping. So why can't I continue to drink coffee? Please know I say this with all due respect. I just recently started drinking coffee again a couple months ago and I have not noticed less IP response. I eat at least one apple everyday ... my favorite fruit. Glad you said in moderation that it is fine. Thankful for that anyway. Awwwwww. Thank YOU for your reply! Those are such good words to hear. My wife drinks about 10 cups of regular tea daily (with soy milk) and not too strong. She feels horrible (pain mostly, but nausea and fatigue too) all the time. Should she consider reducing the amount she drinks? Page processed in 0.0545 seconds (74% database + 26% PHP). 16 queries executed.